Linthorpe pot - 4⅛" (104 mm) high. 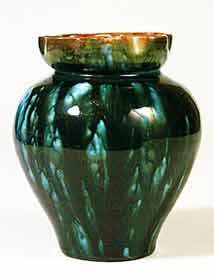 Linthorpe Art Pottery ran for just ten years from 1879 to 1889. It was started by John Harrison at the suggestion of Christopher Dresser, the prominent designer. Dresser supplied many designs for the pottery. Henry Tooth ran the pottery until 1882, when he left to set up Bretby Art Pottery with William Ault. Tooth was succeeded by Richard Patey. Linthorpe was the first company to use gas-fired kilns, and employed many people. The quality of the wares was high and the work was widely appreciated. Linthorpe closed when John Harrison died in 1889. Although its life was short, the pottery, probably due to the Dresser connection, was very influential, and Linthorpe pieces are avidly collected today.